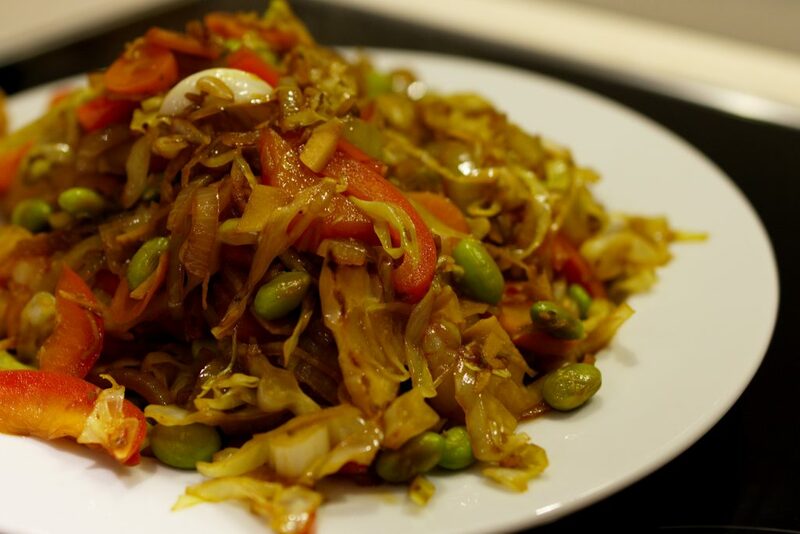 Stir fried vegetables « Hansen Inc.
An easy to make course with inspiration from Asia. The below recipe is adequate for a full meal for one, so just multiply to serve more. Rinse the vegetables. Chop garlic and ginger fine, slice the onion, carrots, cabbage, mushrooms and pepper fruit in 2-4 mm slices. Cut the tofu in cubes less than 1 cm. Heat the oil in a frying pan or wok, add chilli, ginger, cumin seeds and garlic let it fry for a minute and add the tofu (if you like the tofu roasted, else wait to the end), add onions and stir the pan to mix the dish. Fry for 1-1,5 minute while you stir the pan frequently and then add carrots. Continue this process down the list of vegetables. When all vegetables has been fried add the soya sauce and mix well. If you go with the egg add it along with the soya sauce and mix thoroughly. The disk can either be a full meal in it self or it can be served with rice, bread or fish. For variation change some of the vegetables to what you have in stock. Prawns, shrimps or octopus can replace to tofu.